Grain bins much like these modern ones, photographed in southern Africa, were ritually burned down during Africa's Iron Age. The scorched ground beneath them conserved rare clues about the Earth's magnetic field. The fiery demise of ancient huts in southern Africa 1,000 years ago left clues to understanding a bizarre weak spot in the Earth's magnetic field — and the role it plays in the magnetic poles' periodic reversals. Patches of ground where huts were burned down in southern Africa contain a key mineral that recorded the magnetic field at the time of each ritual burning. Those mineral records teach researchers more about a weird, weak patch of Earth's magnetic field called the South Atlantic Anomaly and point the way toward a possible mechanism for sudden reversals of the field. Tarduno told Space.com in an interview that data from the huts suggest that the strange weak patch "forms, and it decays away, and it forms, and it decays away; eventually, one might form and get really large, and then we might actually have a geomagnetic reversal." The South Atlantic Anomaly is a dent in Earth's shield against cosmic radiation, 124 miles above the ground (200 kilometers). It may be the most dangerous place in the Earth's sphere for satellites and spacecraft to traverse, because anything electronic traveling through it is vulnerable to strong radiation from space and tends to malfunction. Even the Hubble Space Telescope takes no measurements when passing over the anomaly. It's an area where, instead of pointing outward, part of the Earth's magnetic field actually ushers energetic particles down instead of repelling them, weakening the overall field in the area. And it has been growing. "Some have postulated that the Earth's magnetic field is leaking out the wrong way at that particular spot," Rory Cottrell, a geologist also at the University of Rochester and co-author of the new paper, told Space.com. "One theory is that changes in the South Atlantic Anomaly could be responsible for the decrease in the overall magnetic field that we're seeing, because these patches are growing or changing over time." This depicts the lower strength of the Earth's protective magnetic field over the Southern Atlantic Anomaly, overlaid with the hot, dense mantle rock of an underlying feature deep below. John Tarduno and other researchers think the irregularity below may cause the weakened field above. Many researchers have speculated that this kind of anomaly is temporary, caused by changes of flow within the Earth's outer, iron core, which generates the planet's magnetic field. Such anomalies, in weakening the magnetic field, may bring the Earth closer to a magnetic reversal — when the magnetic north and south poles on Earth switch places, rearranging the magnetic field over the course of 1,000 to 10,000 years (although it can happen faster). The process generally happens every 200,000 to 300,000 years, after the magnetic field weakens enough, but the last magnetic-field reversal occurred 780,000 years ago. The new data from the African burnings suggests that the South Atlantic Anomaly was up to its same field-weakening tricks over 1,000 years ago; if it's caused by something permanent near the Earth's core, it might play an important role in the Earth's magnetic-pole reversals. Throughout that time, the inhabitants of ancient African villages would burn down the huts and grain bins in their villages on a regular basis, giving scientists key, consistent data throughout that time period. "They had this ritualistic burning of villages," Tarduno told Space.com. "Particularly in times of drought, the conclusion would be that there might have been some offence in the village, so the solution was to have a burning down of the village." 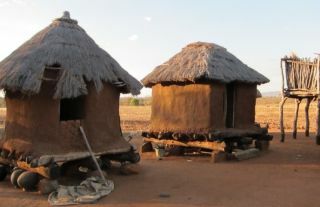 The process was intended to cleanse the village, their collaborator archaeologist Thomas Huffman, from Witwatersrand University in South Africa, said in the statement. At the very least, it cleansed the ground: The burning villages would reach temperatures of over 1,800 degrees Fahrenheit (1,000 degrees Celsius), which would melt the magnetic compounds like magnetite in the clay floors. The magnetite would become remagnetized by the Earth's magnetic field at the precise instant it cooled, ready to be analyzed centuries later. "The hut floors are actually very good magnetic recorders," Tarduno said. "Sort of like minimagnetic observatories back in time." Researchers had obtained very little historical data in the southern hemisphere, and none in southern Africa before these findings. The new baked-clay records revealed an eerily familiar picture of the Earth's magnetic field: Just like today, the Earth's magnetic field at the time was steadily weakening, with a focus on that same South Atlantic Anomaly. The effect did not appear to be continuous, but rather seemed to be a recurring event in that part of the globe, whose weakening power comes and goes over time. This chart maps the location of memory failures, in yellow, for an old satellite, UoSAT-2. They happened much more frequently as it passed through the South Atlantic Anomaly. During solar storms, objects passing through the anomaly are much more strongly affected by damaging cosmic rays. To Tarduno's group, that consistently recurring spot of weakening suggests that a permanent feature deep below the Earth's surface may be generating the South Atlantic Anomaly and might therefore play a role in the reversal of the Earth's magnetic field. That feature is a section of particularly hot and dense mantle rock just above the Earth's outer core. The section is 1,860 miles (3,000 km) below southern Africa and the Atlantic, and it's about as wide as the distance between New York and Paris. Scientists call it the Large Low Shear Velocity Province, and Tarduno's group suspects that its sharp boundaries might disrupt the flow of iron within the Earth's core, creating a strange, field-weakening eddy that could lead to reversals time and time again. The researchers' model is only one of many theories about magnetic pole reversal, and they're focusing on refining the mathematics and gathering more, even earlier data from southern Africa to further track the weak spot. "No one knows what causes reversals, and there is no agreement on whether we can ever even find convincing evidence to forecast a reversal," Ron Merrill, a geophysicist from the University of Washington, who was not involved in the study, told Space.com in an email. While the new magnetic field records in Africa are useful in their own right, he wrote, it will take much more testing and theory to make a solid connection between the feature near the Earth's core and the magnetic field's weakening and reversal (and the long-lasting nature of the South Atlantic Anomaly). The new research can't predict the next magnetic field reversal, but finding a connection between the ancient irregularity near the Earth's core and a weakening magnetic field would be one more step toward deciphering the incredibly complex magnetic system that protects humanity from the harsh radiation of space. This research is detailed in the July 28 edition of the journal Nature Communications.